Gamers of a certain age want nothing more than games they loved as kids to come back onto their current day consoles. That nostalgia feel of seeing games you once loved coming out once again fills our hearts with not only sheer excitement of a game we once loved coming out again for a whole new audience, but at the same time we worry will it capture what the original game did so well. Micro Machines has always been the best when it comes to top down silly racers on our consoles, with any game even attempting to beat it even since always getting a "close, but not good enough" when it comes to getting its scores in reviews on many sites. 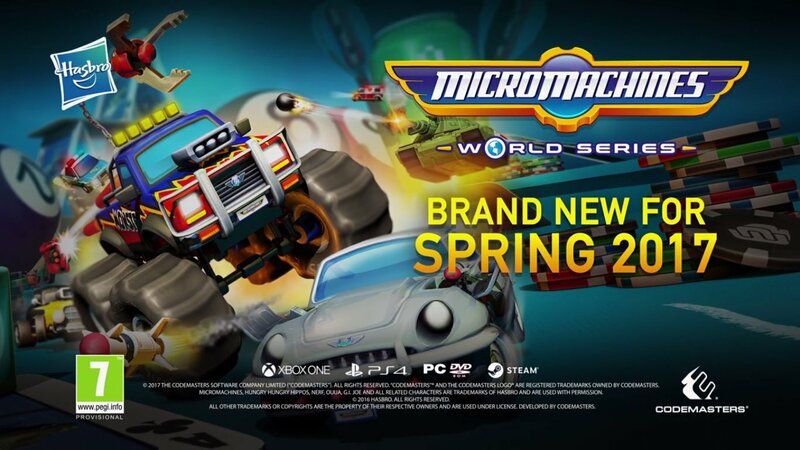 Codemasters saw the call of a new Micro Machines from us all and have finally given in, with Micro Machines World Series set for a release this April on the Xbox One & PS4. This new game promises to bring what the original offered, while also adding in new things to bring it up to date. Micro Machines World Series will offer players a 12 players online & four players split screen option, with the game also offering a variety of environments and each of the 12 vehicles having its own unique load-out of weapons and abilities and customisation options. You can expect to hear more on this game between now and April, as I for one am dying to race around a bath or a breakfast filled kitchen once again.